Fayetteville City Hall is located at 113 West Mountain Street, Fayetteville, AR 72701; phone: 479-718-7600. Photo: The Pritchard House, ca. 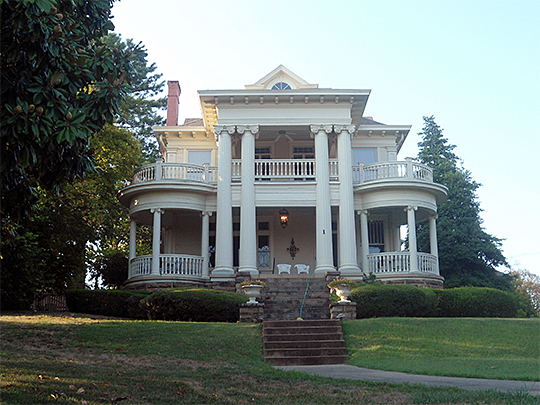 1900, in the Mount Nord Historic District, Fayetteville, AR. Listed on the National Register of Historic Places in 1982. Photographed by User:Brandonrush (own work), 2012, [cc-by-3.0 (creativecommons.org/licenses/by/3.0)], via Wikimedia Commons, accessed January, 2013. The first white man to see Fayetteville's hilltop terrain was Frank Pierce, who had come up the White River in 1819. By 1828, the fertile subsoil of northwest Arkansas had attracted sufficient numbers of settlers to warrant the creation of Washington County, a large tract of land embracing parts of present-day Madison and Carroll counties and all of Benton and Washington counties. Because of its central location, Fayetteville was chosen as the county seat. The town was originally called Washington, but to avoid confusion with 'old' Washington in southern Arkansas, postal authorities requested the name be changed. Since Fayetteville, Tennessee, had been the hometown of two of the founding commissioners, local residents settled upon the name of Fayetteville. Within the next six years farmers, cabinetmakers, innkeepers, and merchants had arrived. By 1830 Washington County boasted 2,100 inhabitants; Fayetteville claimed 75 residents. By 1834 Congress authorized the county commissioners to sell 160 acres of land to underwrite the building of a proper courthouse. An official announcement of the sale was printed in the Arkansas Advocate. Settlers reached Fayetteville by traveling over the trail from Cane Hill or up the Huntsville road. Scouts and roving bands of hunters from Indian country followed Indian paths through Weddington Gap. The route from Jefferson City, Missouri, to Fort Smith, known today as Old Wire Road, became a military road over which cumbersome caravans of wagons brought supplies, household goods, and weary travelers. Several maps of the northwestern region of Arkansas made from 1833 to the early 1860s provide a reference point for understanding Fayetteville's growing importance as a major commercial and transportation center. Washington County and Fayetteville began to grow rapidly. In 1840 the county had a population of over 7,000. Fayetteville numbered 400 residents. Most farmed the rich soil, while others worked in retail and wholesale businesses. People from nearby King's River and War Eagle bought their wares in Fayetteville's six dry goods stores. Peter Smyth House, Washington County, Fayetteville, Arkansas, National Register of Historic Places, listed 10/04/2002, www.arkansaspreservation.com, accessed April, 2012.